The Professional grade is a cleaner product with a more consistent, uniformed particle size that is used on the skinned area of baseball and softball infields to improve drainage. It will not stick to cleats and is easily incorporated into the infield. 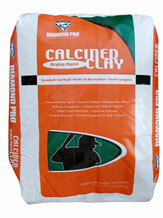 A calcined clay product used to quickly dry puddles and muddy conditions. The finer gradation has more surface area to dry the field faster, reducing the chance of rain delays. It will not stick to cleats and is easily incorporated into the infield. 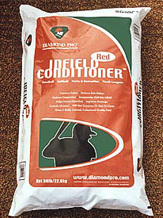 Our Red Infield Conditioner creates a natural look that enhances the appearance of an infield. 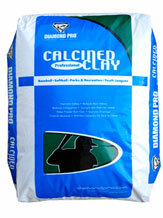 A vitrified clay (expanded shale and clay) product applied to skinned areas of baseball and softball fields. Diamond Pro® fires its vitrified clay conditioners in a rotary kiln at over 2000° F to produce a premium ceramic substance.